Construction began about a year ago on 500 L’Enfant Plaza, a “trophy” class office building developed by The JBG Companies. The building began construction on spec, or without an anchor tenant. However, after building the foundation and loading dock, it appears construction has been stopped for the past couple of months. Has the project been placed on hold until an anchor tenant has been found? 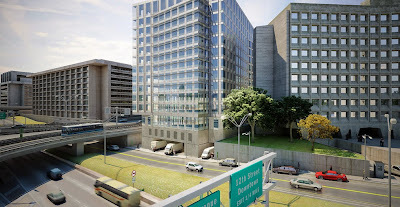 In addition to 500 L’Enfant Plaza, an office building recently delivered at National Square (500 D Street) and remains empty. Other office buildings under construction in the quadrant include 800 and 1000 Maine Avenue at The Wharf. Only one of those buildings has a tenant signed up, so there is plenty of competition in the market. 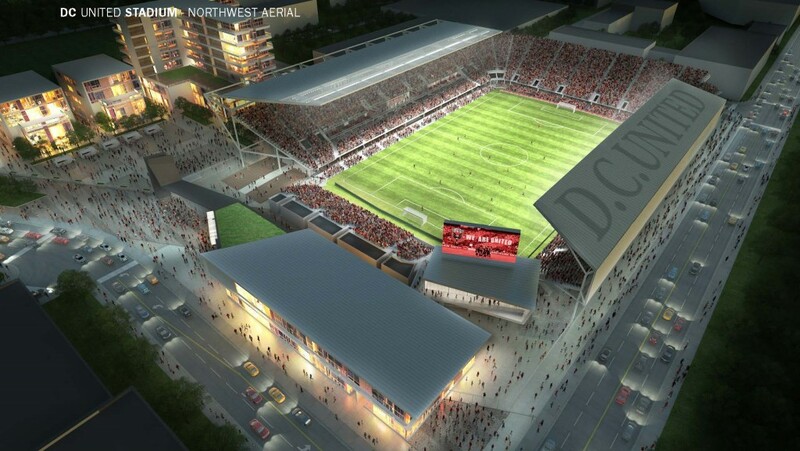 DC United submitted a PUD application yesterday for their new planned stadium on Buzzard Point, to be located three blocks from Nationals Park at 100 Potomac Avenue. 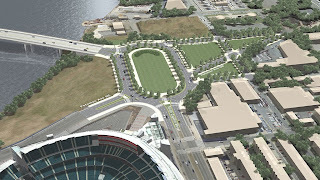 The 19,000-seat stadium has been designed by Populous (the same designers of Nationals Park) and DC-based Marshall Moya as “contemporary-industrial” as a nod to Buzzard Point’s industrial nature. Building materials include glass, concrete panels, zinc and aluminum panels and the stadium will rise to a maximum height of 98 feet. The stadium will also be designed to meet LEED-Gold standards (Nationals Park was designed to meet LEED-Silver standards). No on-site parking is planned, although 3,400 off-site parking spaces have been identified for use by patrons, both on Buzzard Point and at parking lots used for Nationals games. There will be 233 bicycle spaces, although it is unclear whether a bike valet will be set up at the soccer stadium like Nationals Park. 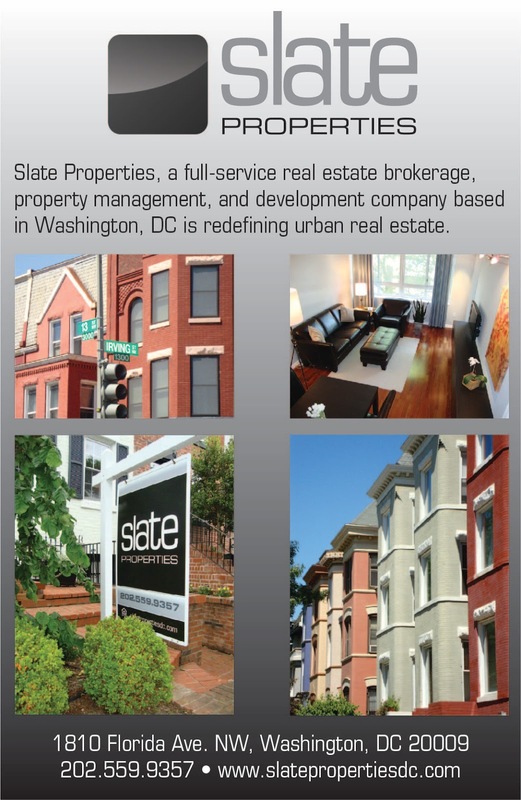 The main entrance will be on the northeast corner of the site at a plaza along Potomac Avenue with 18 gates. From Potomac Avenue, spectators will get a view of the inside of the stadium and field since the pitch will be near ground level. The zoning application touts this street-activating feature as unique to any other professional sports stadium. Premium ticket holders will enter through a separate gate area south of the main entrance. Other entrances for fans will be at the northwest and southwest corners of the stadium. An entrance on the southeast corner will be used for media. Ticket booths will be located on the east side of the stadium. A building straddling the stadium at the corner of 2nd and T streets will contain retail on the first floor with office space on the second floor outside of the stadium. Inside the stadium, this building will contain concessions on the first floor and DC United’s offices on the second floor. The team’s locker room will be in the basement of this building. Decorative fencing will run along the west edge of the stadium along 2nd Street and a pedestrian walkway will be located on the east side to minimize disruption of the pedestrian flow on 1st Street. Most of the seating will be on the east side of the stadium, due to an easement with Pepco which gives the utility access on the east side of the property. The west side of the stadium has outdoor seating while the east and north sides will have both outdoor seats and suites. The team store will be a separate, one-story building fronting R Street, located to the northwest of the main entrance so it will be accessible not just during game days. There is a separate parcel on the northeast section of the stadium footprint adjacent to the entry plaza that is not a part of the PUD application. This parcel will be developed in the future, likely as a hotel with retail. The stadium is scheduled to start construction in September, although PUD approval is needed first and the city needs to do environmental remediation and utility work to prep the land for construction. Construction is expected to be complete in time for the start of the 2018 MLS season. Stay tuned for more about this project. The type of small-scale infill development currently lacking in most of Southwest is coming to Buzzard Point. A Zoning Commission application was recently submitted for Stadium District Lofts, an eight-unit apartment building planned by SW resident Tyler Merkeley at 1542 1st Street, located between Lucky Kabob Indian Restaurant and High Road Primary & Middle School. The proposed project is located within the Capitol Gateway Overlay, hence the need for the application. In addition, the project sponsor is requesting a variance to not include parking due to the small lot size and access constraints since there is no alley. In lieu of vehicle parking, a total of 11 bike parking spaces will be provided – three long-term and eight short-term. Stadium District Lofts is planned as a five-story building (the application says four-story, but the rendering appears to be five stories) with a brick façade on the east and west elevations. 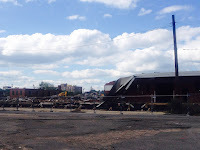 On the north and south elevations, the material will be fiber-cement board panels – these two sides of the building will likely be covered over time by eventual development of the lots to the north and south - the Zoning Commission statement from the applicant states the Lucky Kabob/Shulman’s site is currently for sale. The unit mix will include one 1BR, five 2BRs, and two 3BR units. Green features include a bio-retention rain garden and the potential for a green roof, which would qualify this project for LEED-Silver certification. The proposed project would replace a fire-damaged single-family home that is in the process of being razed. The owner of a rowhouse around the corner from this site on Q Street applied for a raze permit recently and it’s likely a denser residential development will be planned there as well. This is one of several planned developments on Buzzard Point, which is starting to get attention since DC United decided to locate their new soccer stadium in the neighborhood. A hearing is scheduled for Stadium District Lofts on St. Patrick’s Day. The project will replace the current entrance escalators, which are more than 20 years old and have exceeded their useful life, with brand new escalators that are more durable and reliable. Metro's contractor, KONE, will install the new escalators one at a time, while keeping two units in service for the duration of the project -- one running up and one running down. 2016 will be a big year for Buzzard Point as a multitude of projects both large and small are expected to get underway on the peninsula. The most high-profile project is construction of a new soccer stadium for DC United, which is scheduled to start by September. 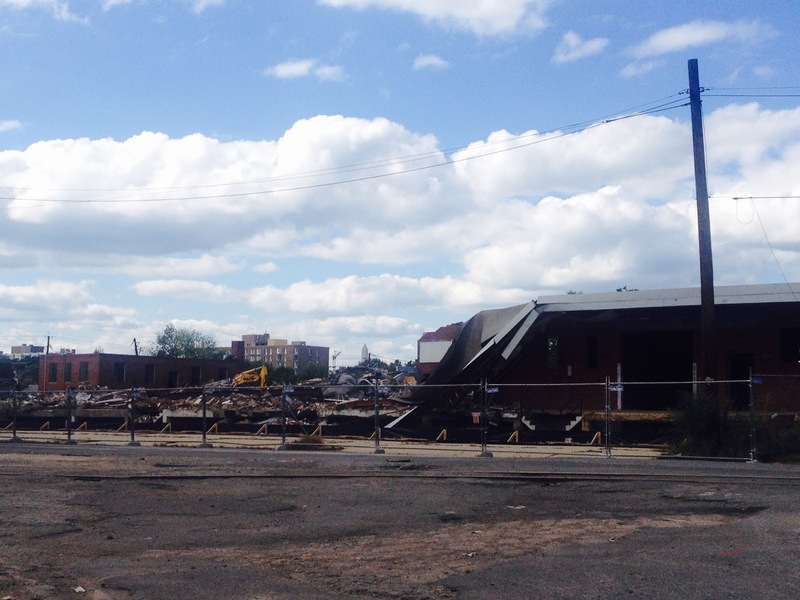 Raze permits were filed last month for the parcels the city purchased in the stadium footprint, including Super Salvage which is now closed. Meanwhile, eminent domain proceedings are underway for a two-acre parcel in the stadium footprint previously owned by Akridge. The city still needs to remediate the stadium site before construction can begin, which is filled with containments due to the area’s former heavy industrial use. The 20,000 seat stadium will be located at 2nd and R streets and is scheduled to open in time for the beginning of the 2018 MLS season. Pepco has already cleared land across R Street from the stadium site to build a new substation in order to handle all of the new development occurring in Southwest and Navy Yard/Near SE/Capitol Riverfront. 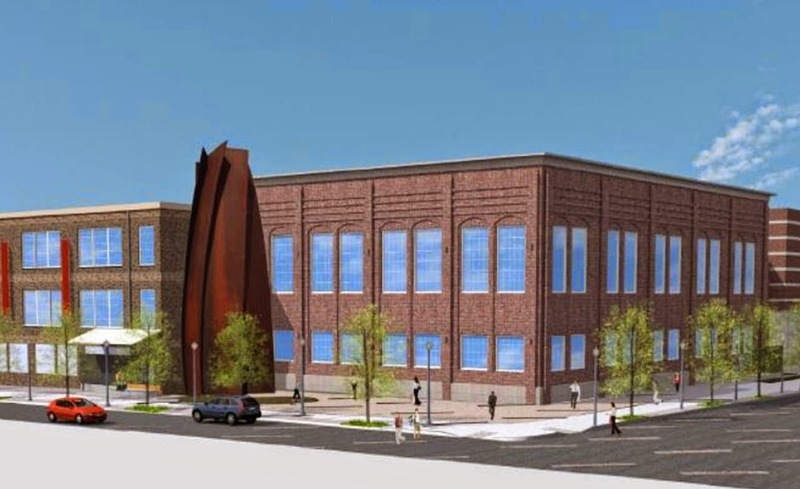 The new Waterfront substation has been designed to blend in with the area and will replace the unsightly exposed substation that currently exists a couple blocks to the southeast. 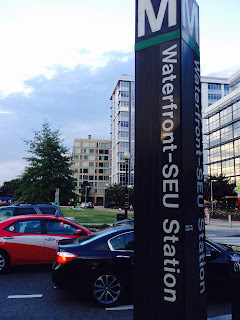 On the southeastern side of the new substation where R Street, 1st Street and Potomac Avenue intersect, the area will complement the public plaza planned as a part of the new DC United stadium. Aside from the substation, transmission lines will be installed along several nearby streets. The new Waterfront substation will be open by June 2017. Five years after Marina Place was approved and more than a decade after it was first proposed, the condo and retail project may finally move forward this year. 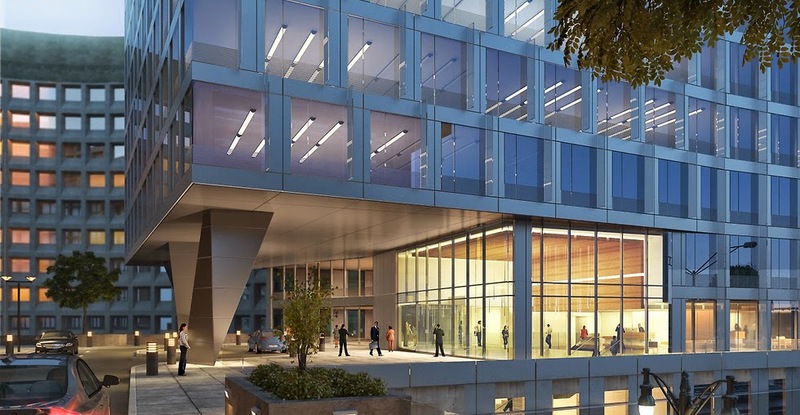 Capital City Real Estate purchased the lot fronting the recently shuttered Buzzard Point Marina at 1st and V streets from Duane Deason in December for $9.8 million, according to the Washington Business Journal. 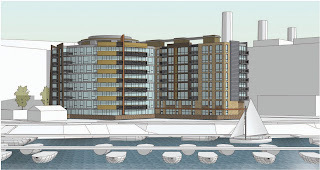 The new owners are planning a 90-107-unit condominium project, which will have sweeping views of the Anacostia and Potomac rivers due to its location near the tip of Buzzard Point. Construction is expected to wrap up by early 2018. A raze permit was filed last month for 69 Q Street, a row house dating to the late 1800’s recently purchased for $599,000 according to Zillow. No details yet on what will replace it, but it is a block east of where a new hotel and hostel by Carr Hospitality is supposed to be built. Construction of a new Frederick Douglass Memorial Bridge and traffic oval by DDOT is also expected to begin by the end of 2016 or early 2017. The two-phase project involves building a new, six-lane bridge across the Anacostia River with pedestrian and bike paths, as well as new traffic ovals on either side of the bridge, the transformation of South Capitol Street into a grand urban boulevard with interchange improvements including an at-grade intersection at M Street and new ramps to I-695. The interchange improvements are part of the second phase of construction. Hoffman-Madison Waterfront (HMW) has filed with the Zoning Commission to modify the approved Stage One PUD for Pier 4, located adjacent to the new Waterfront Park currently under construction at The Wharf. Initially, the plan was to work on Pier 4 in the third phase of The Wharf, but HMW has decided to move up construction of Pier 4 to coincide with the completion of Waterfront Park, in order to minimize disruption to the park. In addition, the development team seeks to change the permitted use from residential to commercial in light of the lack of support from the U.S. Army Corps of Engineers to allow townhouses constructed on the pier. Instead, Pier 4 will continue to be be used by Entertainment Cruises, which currently operates out of the pier and neighboring Pier 3. Entertainment Cruises will consolidate its operations to Pier 4. To renovate, including constructing additional stories not to exceed a total structure height of 55 feet above the existing site, in the same roofline footprint; to construct an approximately 23-foot wide by 200-foot long pier at the channelward end of the existing pier structure, to install two dolphins; and to construct a 20-foot wide by 40-foot long floating platform with 6 piles on the west side of the existing pier, all to extend a maximum of 530 feet channelward of the existing bulkhead. The plan for the pier is to maintain the brick head house structure for passenger ticketing and locker rooms for employees and build a two-story addition to the existing concrete canopy structure located behind the head house. McGraw Bagnoli Architects has designed the new pier building as a concrete structure with wood and metal accents. A passenger staging area, restrooms, and office space will be located on the first floor while the second and third floors will contain more office space and terraces, both covered and uncovered. The existing head house building at Pier 4 will remain. 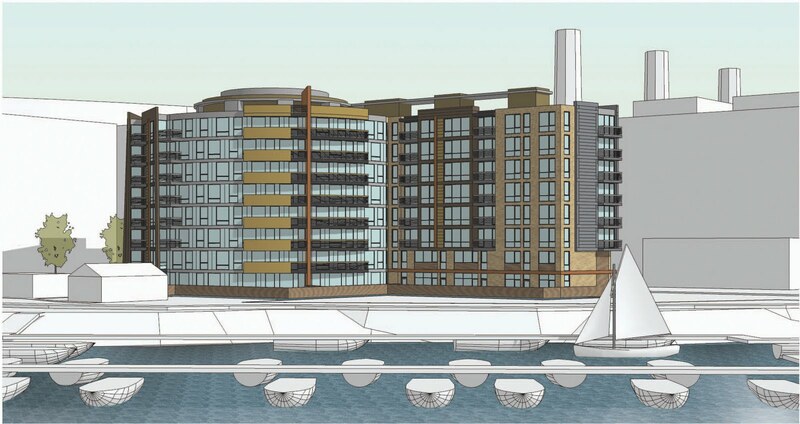 HMW will go before the ANC next week to seek their support for the change in plans to Pier 4. The corner of South Capitol and I streets looks a little brighter these days with new windows recently installed at the Capitol Skyline Hotel. The new windows at the Capitol Skyline Hotel have a white frame, which gives the hotel exterior a much different look compared to the old blue-framed windows. Across the street, windows at Randall Recreation Center have been painted, security bars removed, and doors replaced. One of the windows at Randall will also be replaced. The improvements at Randall are a result of money given by the Bernstein Companies as a part of their PUD approval for Town Center East. In addition, DPR has $250,000 available to make ADA-compliant improvements to Randall, but they are seeking more funds in the FY 2017 budget to make additional improvements. A new turf athletic field at Randall is now mostly complete. A partnership between DPR/DGS, the Washington Nationals Dream Foundation, Cal Ripken, Sr. Foundation, and Under Armour have teamed up for the effort, which includes a new turf field, scoreboard, and dugouts for youth baseball/softball and soccer. The position of the ball field on the southwest corner of Randall Field shifted to the northwest corner. Only one of the fields will be turf – the other ball field on the southeast corner will remain grass due to lack of funding. The changes to the field will accommodate youth sports to the detriment of adult sports leagues due to the source of donated funds for the project. Below are some more photos of the new field. New scoreboard is at left. Construction of 525 Water Street condos at The Wharf is progressing, with most of the exterior now covered in brick. By spring, the condos will be ready for occupancy. 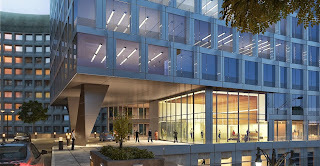 This will be the first new building to be complete in The Wharf and the first new construction condos to be built in Southwest since Potomac Place Condos were finished in 2005 (Waterfront Tower was a condo conversion). VIO, the other new condo building planned during the first phase of The Wharf, is also under construction and is scheduled to be completed in 2017. Meanwhile, the steel frame of the new St. Augustine’s Episcopal Church continues to rise along Maine Avenue. 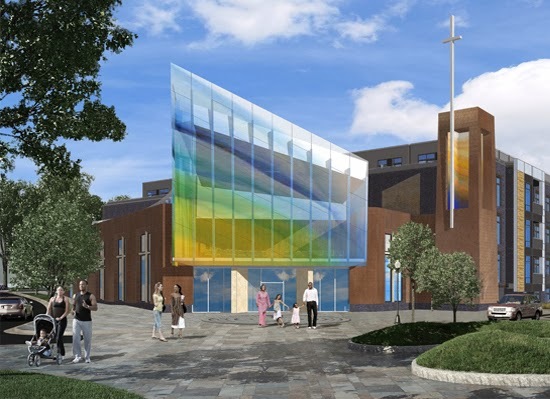 At the new St. Augustine’s, there will be views of the church from M Street and Maine Avenue since it will be located at a prominent corner. There will be a soft curved edge in front of St. Augustine's to complement the curvature of Arena Stage across the street. The two-story church will be approximately 15,000 square feet with the sanctuary located on the second floor offering views toward the Washington Monument. Also on the second floor will be classrooms and a library. On the ground floor, the entrance will lead to a vestibule that connects to classrooms and an all-purpose room, which will be available for community events, similar to how the former St. Augustine's building was used for meetings. The church began construction last May and is scheduled to be completed later this year. Waterfront Park, the 3.5-acre green space to be located behind parcel 11, began construction in the fall, but completion is still several months away. Park elements include plantings, pergolas, a water feature, play mounds, pathways, seating areas, an access road for the Harbor Patrol, and a plaza. The plaza will be named after DC Delegate Eleanor Holmes Norton - the section of the park between the access road and the Wharf promenade.